Sorry, we cannot offer refunds on tickets to this event. This purchase will appear on your credit card statement as a purchase from Blitz. Refunds: Please contact Gina Groh at 212.300.4046 or click here to email. 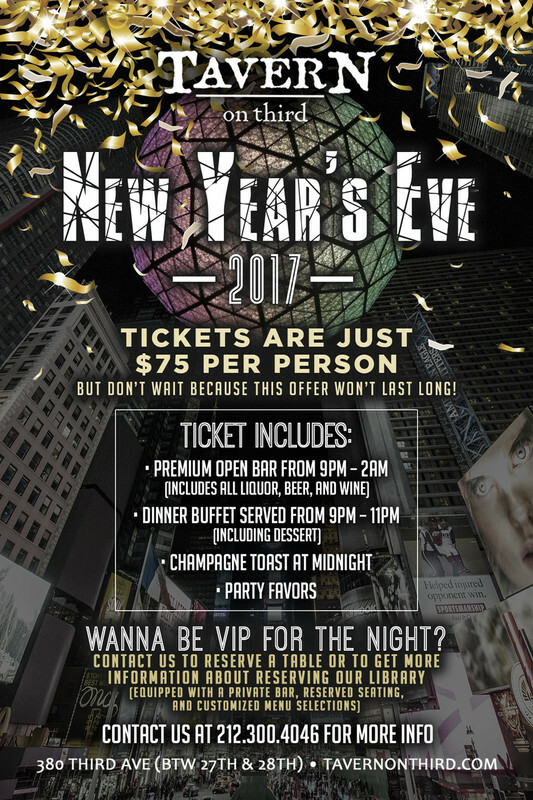 Includes entry, dinner buffet, open bar from 9pm-2am, champagne toast, and party favors. Online ticket sales are over. Tickets may be purchased at the door for $100. 5…4…3…2…1… It’s the most exciting countdown every single year, stressful and annoying to plan, and it’s right around the corner. At Tavern we’re here to help. What’s most important on New Year’s Eve? We're guessing: good booze, good company, good music, and of course that midnight kiss. Done, done, done, and well… you're on your own for the last one! Wanna be VIP for the night? Call us to reserve a table or to get more information about reserving our Library (equipped with a private bar, reserved seating, and customized menu selections). Call us at 212.300.4046 or email parties@tavernonthird.com for reservations. So get dressed in your NYE best and we’ll have a shot waiting for you here at Tavern when the ball drops!